The Lumenis Lume One laser machine is exactly what it claims to be – an all-in-one cosmetic system that can perform virtually any aesthetic procedure. This system includes an incredible 1,500 pre-programmed treatment parameters and it offers a variety of treatment methods, including IPL therapy, an Nd:YAG module and the Lumenis LightSheet attachment. That makes this one of the most powerful and versatile systems on the market, and SunrayLaser.com makes it more affordable than ever. Despite its considerable power and advanced technology, the Lumenis Lume One laser system is remarkably easy to use thanks to an intuitive touch screen interface and the ability to track and store patient histories. 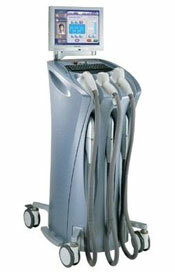 For added patient comfort, this system offers a constant contact cooling system and Optimal Pulse technology. If you are interested in this system, contact us right now for a low price quote on a pre-owned Lumenis One laser machine. The high cost of a new Lumenis Lume One laser machine puts it out of the reach of many businesses, but at SunrayLaser.com you’ll find used Lumenis Lume One laser systems for sale at up to 60% off the original cost. And when you buy a pre-owned Lumenis Lume One from SunrayLaser.com, you get the security of our 100% satisfaction guarantee. If you need a fast price quote on Lumenis Lume One laser equipment, all you need to do is fill out the contact form below. We’ll respond promptly with pricing information with absolutely no obligation at all on your part.